El Calamareo, just northeast of Corralejo, is a ten meter high barrier filled with caves, volcanic rocks and fish. To the northeast of Corralejo, at approximately one mile off the coast in the direction of Lanzarote, the reef of Calamareo is situated. It can only be reached by boat, in approximately 5 minutes. The reef extends in an east-west direction, and is a wall falling vertically down to 22 meters maximum, forming vaults, large and small caves, canyons and passageways, with many large volcanic rocks. There is a wide variety of fauna. 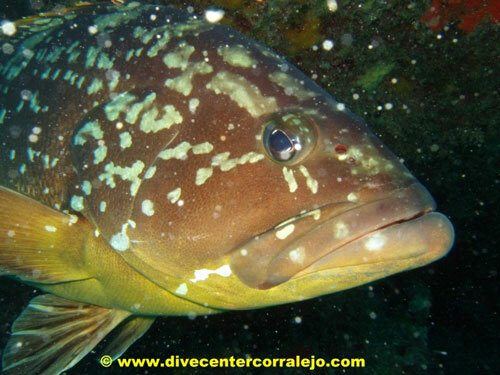 Glass Eyes, Trumpet Fish, Groupers, Canarias Lobsters and Parrotfish. You will find many species including Bream, Barred Hogfish, Angel Sharks, and different types of rays. We position the boat close to the edge of the drop-off. The rope serves as a reference point for our descent, as well as doing the safety stop. The currents are not usually very strong here. But if there is a current it is best to use the edge of the wall as protection. The recommended tour for novice divers, is to swim in either an easterly or westerly direction keeping the edge of wall on one side, and returning the same way. For the more experienced diver, the route is similar, but in the deeper area at around 20 meters, and returning in the upper area at about 10 meters. Again you can swim either to the left or the right. Depending on whether you wish to explore the area of the canyon, or the area of sand and occasional cave. El Calamareo lies northeast of Corralejo approximately 1 kilometer from the coast in the Lanzarote direction. Type of seabed: There is barrier running from east to west with an upper part of volcanic rock at about 15m depth and a base of white sand at 25 meters maximum, forming vaults, wide, shallow caves and rock corridors. Life forms: A great variety of animals inhabit this zone; inside of the caves are glass eyes, larger fork beards, greater locust lobsters etc. In open water, striped barracudas, dusky and comb groupers, parrotfish, white bream etc. Dive: Area frequently passed by the Ferry boat, we will follow the barrier along at its upper surface about 10m eastwards or westward and the back along the same route.